Your saltwater aquarium is ready for its first fish. Damsels are often the first saltwater fish recommended to beginner hobbyists by most fish stores. Why? Most damsels are very hardy, but there a few things you should know before purchasing one for your fish tank. Despite being inexpensive, most damsels are extremely aggressive and may harass future additions. After being added to an aquarium, they can be challenging to remove. Most will have to invest time chasing them around with a net, removing the live rock to make capturing them less difficult and finally re-aquascaping the live rock if the damsels have been caught. Some aquarists may also spend money on a fish trap and experience accidental fish loss due to the stress of rearranging the aquarium. Please take these factors into consideration before adding a damselfish. 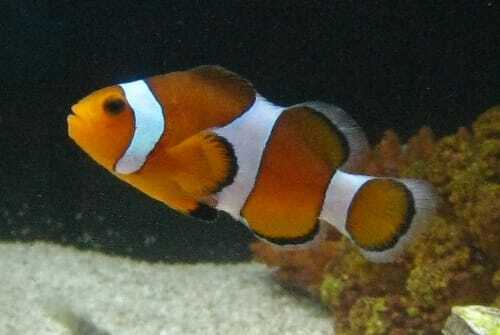 Made famous by a popular children’s movie, the False Percula or Ocellaris Clownfish is good first saltwater fish. Captive bred, also known as tank raised, clownfish are commonly available and are far less prone to disease than wild caught clownfish. False Percula Clownfish make excellent first fish because they are hardy, rarely hide and generally not aggressive. Other species of clownfish are usually more aggressive like damsels and can be especially territorial if an anemone is added to the aquarium. Please note that clownfish do not need an anemone to survive and anemones do not need a clownfish to survive. Other popular beginner fish include a variety of Blennies, Gobies and Wrasses. Most species are fairly hardy and not aggressive, although there are always exceptions, so proper research should be taken before purchasing any new fish. In a reef tank, Dwarf Angels and Tangs are usually the last fish added as they can become territorial and aggressive towards new additions. Always remember to check for fish compatibility, difficulty, feeding requirements and maximum size before adding a new fish. Please note, the fish seen in a popular children’s film are not compatible with each other, so please don’t try to recreate that aquarium. Once you have selected a fish, reexamine it for signs of disease and odd behavior. You may also ask the store to feed the fish to make sure it is eating. Also be sure to get fish food; brine shrimp, mysis shrimp and seaweed are the most popular foods. Be sure to ask if your fish requires special care. When you arrive at home, it is important to properly Acclimate your new fish. Some aquarists also quarantine any new fish to prevent disease from entering the display tank. This is a good practice for beginner hobbyists to develop as it forces them to be patient and not overstock their aquarium too rapidly. Stocking an aquarium too quickly can lead to ammonia spikes that can increase the risk of disease and kill all the fish. Continue to monitor your Ammonia, Nitrite and Nitrate as your aquarium may begin to cycle.